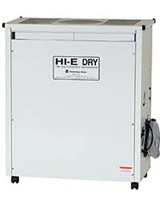 The HI E Dry dehumidifier is manufactured by the Therma-Stor company located in Madison, Wisconsin. The company was founded in 1977 and its first products were heat recovery water heaters. A little later it began production of the Santa Fe range of free standing dehumidifiers for basements and crawl spaces and the Ultra-Aire range of ducted and installed whole house units. It also supplies water damage restoration models under the Phoenix Brand and the HI-E Dry line for commercial applications and swimming pools. Therma-Stor products are renowned for their energy efficiency and effectiveness across a range of temperature conditions and the HI E Dry Brand contributes to that reputation. The HI-E Dry range includes the following models. The Therma-Stor HI-E Dry 100 is a powerful and energy efficient unit which is designed for effective operation in a range of commercial applications, including swimming pools. Capable of removing a little over 100 pints of water per day the HI-E Dry 100 will manage humidity effectively in areas of up to 2500 square feet. The HI-E Dry 100 is a versatile appliance which can work well across a broad range of temperatures from 33°F to 110°F (1-43°C). The HI-E Dry 100 may be used as a stand-alone unit or may also be ducted to enable it to operate outside the drying area or to control moisture in several smaller enclosed areas. Although designed primarily for commercial operators some house-holders with a large, cold basement may wish to consider the 100 as an alternative to other basement models for use in their home. The Therma-Stor HI-E Dry 195 shares the features and capabilities of the HI-E Dry 100 and is designed for similar applications. The HI-E Dry 195 is a much more powerful unit with almost double the water extraction capacity of the HI-E Dry 100 and is suitable for much larger areas, up to 5000 square feet in size. The 195 achieves excellent energy efficiency which is largely achieved by pre-cooling the ambient air before it passes over the evaporator coils. This is similar to the "low grain refrigerant" technology used in restoration units and allows a greater degree of dryness to be achieved in addition to the energy savings. A useful feature of the HI-E Dry 195 is an internal condensate pump with sufficient power to achieve 17 feet vertical lift. This feature allows greater flexibility to operators when selecting a discreet and convenient location for the unit. The Therma-Stor HI-E Dry Vehere is broadly similar to the HI-E Dry 195 although it lacks an integral pump to dispose of the condensate. The HI-E Dry Vehere is optimized for use in swimming pools in which floor drainage is usually available and where a condensate pump would add additional cost for no appreciable benefit. The Vehere benefits from a corrosion resistant stainless steel cabinet which improves its appearance for use within the pool enclosure and protects it against the high humidity found in this application. While ideal for swimming pools and other high humidity applications the Vehere is more expensive than the basically similar HI-E Dry 195 and the cheaper model will probably be preferred for other applications in drier conditions or where a ducted installation is possible.